With her life falling apart around her, Valerie Stephens decides that she needs to start saying “yes” to adventure. And a sister trip to Ireland is the perfect way for her to start. 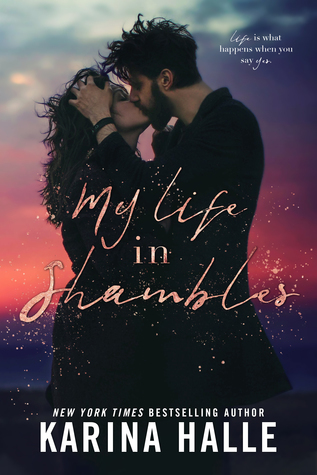 My Life in Shambles was an incredibly poignant story about heartache and imminent loss, and that in even the darkest moments of life, you can find the type of true love that can sustain you through anything. Valerie and Padraig’s whirlwind Irish love affair was as beautiful as it was tough to handle at times, but with their combined strength and belief in the love that they share, these two strong people can get through anything that life throws at them… as long as they’re together. Before leaving the US, Valerie has endured a couple of rough weeks. From the break up with her fiancee, to losing her job, she quickly comes to realize that nothing in life can be taken for granted. Using her trip to Ireland to reset her priorities, it only takes one fateful night for her to catch a glimpse of the lonely man who will change her life forever. Padraig wants to be left alone in a crowd of many. But when he speaks with Valerie, he immediately decides that he needs to get to know everything about her. From a fantastic first date to a crazy proposal the morning after, what could have possibly ended as a typical vacation one night stand turns into the kind of forever that Valerie and Padraig never saw coming. I really loved this book. From the vast details of Padraig’s diagnosis, and the journey he ultimately has to go through to accept his new normal, I felt that the entire storyline came from a genuine and scarily real place. Valerie was an amazing woman who rolled with the punches and genuinely cared about helping out Padraig and his quirky family, in which she quickly falls for. The relationship was quickly steamy from the beginning and sizzled throughout the book, even when life had other plans. I genuinely felt that the love and attraction between Valerie and Padraig was something that was so honest and essential in the wake of the rest of the struggles in their lives.